Don't Pay Unnecessary Admin Fees. Some websites charge an admin fee to book your driving and/or theory test. BUT, if you book through the DVSA website then you only pay for the test. ALSO, you receive ALL the DVSA booking guarantees. Clicking on the DVSA link below takes you direct to the DVSA booking service. What can I say; Dave was a godsend to me. Before I contacted Dave I was with another instructor but was getting nowhere. I knew from the start that Dave was a good instructor; he was very very patient with me and explained everything fully to me in simple terms. I have and would recommend Dave to anyone thinking of taking lessons. I passed first time all thanks to Dave and his excellent tuition. Thanks!! To change or cancel a test without losing your test fee you must give the DVSA 3 clear working days notice. Note: exceptional circumstances e.g unexpected medical reasons, bereavement, school exams, etc. will be considered at short notice. the Eco-Safe Driving for learner car drivers. Show & Tell questions (and answers). Instructions given by the examiner. After having driving lessons 10 years ago with an awful instructor, I was completely put off driving and genuinely thought I wasn't meant to be a driver! However, at the age of 30, I decided to give it another go. I was extremely nervous and uptight when I first started with my new instructor, David, but with his calm and positive instruction, I soon relaxed and started to actually enjoy my driving lessons. Four months later, with David's help and support, I passed my driving test...and first time no less! I can't believe what I have achieved in such a short space of time! Thanks to David's excellent tuition, I now have the confidence to take to the road myself. Go with Glencor if you not only want to pass your driving test, but also to learn how to be a good, calm and safe driver. Driving Test Fees, Monday to Friday normal business hours - £62, otherwise £75 (e.g. weekends). If requiring an extended test the fees are - Monday to Friday normal business hours - £124, otherwise £150 (e.g. weekends). What's involved? - on the day of your driving test, the examiner will ask you two questions about your vehicle. One question before you start driving and one question while you're driving. What's the score? - answer any one (or both) of the questions incorrectly and you'll receive one driver (minor) fault towards your driving test. If you loose control during the show me question then you could receive a serious fault. Results given on the day. What are the questions, (and the answers)? - Show & Tell questions (and answers). Dave made learning to drive relaxed and fun. He helped to build my confidence from the start and never tried to hold me back at any point. He also talked over with you any mistakes you made and helped you understand how to correct them. For anyone looking to learn to drive I would definitely recommend Dave of Glencor. What's involved? - meet your examiner in the test centre waiting area where he/she will ask for your documents and require you to sign the top of the test report to declare your residency and vehicle insurance (the Glencor Driving School car is fully insured for learner lessons, tests and the Pass Plus lessons). The examiner will ask if you want someone (e.g. your instructor) to sit in the back seat of the car during your test, and/or, if you want someone (e.g. your instructor) to listen to the debrief after the test. The choices are entirely up to you. You will then leave the waiting area and you must take your driving licence with you when going out to your car. Once outside, you'll be asked to read a car registration plate and if glasses or contact lenses are used at this point then they must be used whilst driving (the test will not continue if you are unable to read a vehicle registration plate from a distance of approx 20.5mtrs AND you will not receive reimbursement for the test and will therefore have to pay for your next test). You will then go over to your car and be asked a 'tell me' question. During the driving section you will be required to execute a minimum of one of the three manoeuvres. Dave is an amazing instructor. After little progress with other instructors, Dave's calm demeanour, clear explanations and endless patience restored my confidence and I finally passed my test today. He teaches you not simply how to pass the test, but how to drive well. He made things that had evaded my understanding for years seem so simple and achievable. I couldn't recommend him enough. Thank you Dave! Independent Driving - during the driving test the examiner will either:-. d. A combination of the above. You can at any time ask for these directions again or even pull up at a safe place at the side of the road to confirm the directions. The examiner will also ask you a 'show me' question while your driving. If you are unsure of how to use the control asked for, then you can ask to pull over at a safe place and then use the control. What's a pass? - complete approx 40 mins of driving (twice this for the extended test) and accrue less than 16 driver (minor) faults with no serious or dangerous faults. Results given on the day. A serious fault is where the learner driver could have caused a collision but no action was taken by the examiner or any other road user. A dangerous fault is where the examiner or any other road user took action to avoid a collision due to the learner driver's actions. Calm and Positive, David let me take my lessons at my own pace. I am now fully confident in my driving all thanks to Glencor Driving School. Thanks again! Eco-Safe Driving - eco-safe driving is also part of the driving test. An eco-safe driver will look ahead and plan for any hazards so as to make efficient use of the accelerator, brakes and gears thus reducing exhaust emissions. Study material - your best option is to find a good driving school instructor, and if possible, drive between your driving school lessons (this helps to build your driving skills and more importantly, your driving confidence). Study material can also be found in book, DVD, CD-ROM or online. Where to buy - from various stores and from the DVSA Online Shop. When To Apply For Your Driving Test - As soon as you are ready, you will be encouraged to apply for your driving test. Your Glencor driving instructor will provide you with his driving instructor number (ADI number). This is required so as to help prevent a double driving test booking. Glencor Driving School reserves the right to reschedule driving a test OR to not take candidates for test if Glencor Driving School deems the candidate to be not ready for the driving test. I had 5 instructors previous to starting lessons with Glencor Driving School and Dave's method of teaching was far superior to each of them. He gave me the confidence to stick at learning to drive and taught in a very patient and calm manner. I was overjoyed to pass first time and would 100% recommend Dave to anybody who wants to learn no matter how anxious they may be. Thanks again, Dave. Passed first time with Dave due to his patience and unique ways of helping me with parts of driving I struggled with. Would pick him every time for lessons and highly recommend him. Kilmarnock Closed 27TH October 2011 - 71 Whatriggs Road, Kilmarnock, East Ayrshire, KA1 3RB. Have also extensively used the Ayr driving test centre and Cumnock driving test centre. If you have a photo licence - take the photocard of your valid driver's licence. (Although tests can be conducted without the theory pass certificate you should take it because it is proof that you are entitled to take a driving test). If you don't have a photo licence - take your driver's licence plus a valid passport. (Although tests can be conducted without the theory pass certificate you should take it because it is proof that you are entitled to take a driving test). I have recommended Glencor to a number of my friends as I found David to be very patient and calm giving me the confidence I needed to learn. I passed my test first time within 6 months of taking lessons. With my older sister passing first time with Dave, Glencor was definitely my first choice for lessons. Dave was always very calm and explained everything very well. If there was ever anything I was unsure about Dave would always make sure we spent time on improving it and making it perfect. I would recommend him to anyone. For the safety of the candidate and the examiner, the DVSA do not conduct tests during poor light or adverse weather conditions (e.g. frost, high winds, etc.). Another appointment will be arranged at no further cost, but other compensation is not payable for these circumstances. Candidates should call the telephone number quoted on the appointment letter to check whether their test will go ahead. lost earnings through taking unpaid leave (usually for a half day). If you need to cancel your test at short notice due to medical reasons then the DVSA will consider arranging another appointment at no further cost. A doctor's certificate is usually required. If you are unable to complete the driving test for reasons that are attributable to your vehicle, then you will have to take and pay for another test. Would like to say a massive thanks to David for helping me pass me test first time, his laid back and professional attitude really put me at ease. In the end I really looked forward to my lessons, would highly recommend him. Thanks again. At first I was nervous about learning to drive, but David helped me realise that it is an enjoyable privilege to be able to drive. It was very easy to discuss any problems with driving I had with him. Davie is an excellent instructor, very patient and supportive. Always had a good laugh! Although this option is available, your Glencor Driving School instructor would only ever sit in at your request and would NEVER insist on sitting in. At the end of the driving test your examiner will give you a debrief. At this point it could be beneficial to have your driving instructor listen to the debrief. Your Glencor Driving School instructor recommends that you use this option, especially if your instructor is not sitting in during the test. Your Glencor Driving School instructor (like all other instructors) will pick you up one hour before your test (for a final recap). At the end of this hour you will be taken to the Test Centre to start your driving test (approx 40mins driving followed by the examiners debrief then the drive back home), thus making two hours on the day. Note: For those taking an extended test this will be two and a half hours due to the longer test time. Repeating a driver (minor) fault several times can be deemed as serious and therefore result in a test fail. The Test Centre does not supply cars for test. I passed first time with Dave he's a great instructor, clear instructions and made driving fun, easy and stress free. I would definitely recommend him to anyone. Currently, cars presented for a driving test do not require dual controls but the following criteria must be satisfied. A speedometer that measures speed in miles per hour and kilometres per hour. The vehicle must be legal and roadworthy and have no warning lights showing e.g. the airbag warning light. Some convertible vehicles are unsuitable for the driving test - e.g. the Ford KA convertible and Mini convertible due to the lack of all-round vision for the examiner. If you propose to use a convertible vehicle for the driving test please check its suitability when you book. Like driving instructors, the examiners are regularly checked to ensure that they keep to a high standard. If this happens for your driving test then simply remember that the SE is not assessing your driving. The SE is only assessing your examiner. The DVSA has agreed with the DVLA that examiners can report any number plates which appear to be illegal. I found learning with Glencor a really great experience. My instructor was very nice and friendly, who moved at a pace that suited me. I now feel fully confident in my driving. Thank you. Question - Read the 'Questions' for the official DVSA 'Questions' for the driving test 'Vehicle Safety Checks'. Answer Details - Read the 'Answer Details' and you should be able to give the correct answers. Additionally - The 'Additionally' are not required for test, they are simply to give you better understanding / knowledge. Diagrams of your Glencor driving instructor's car are included. I found learning to drive with Glencor a great experience. I enjoyed every minute of it and couldn't wait for my next lesson. David was helpful, patient and very pleasant. He was very encouraging and made you feel at ease immediately and questions or queries were answered fully. I would not hesitate to recommend him to anyone looking for a good driving instructor. On the day of your driving test you will be asked a 'tell me' question before you start driving. Question - Tell me how you'd check that the brakes are working before starting a journey. Answer Details - Brakes should not feel spongy or slack. Brakes should be tested as you set off. Vehicle should not pull to one side. Additionally - Once the car is moving slightly, press on the brake pedal and check that it is working properly and stopping the car in a straight line (if the car pulls to the left or right then there could be something wrong with the brakes on one side of the car). There should be no unusual or grinding noises when braking (a grinding noise could be due to worn/faulty brake pads). If there is anything incorrect with the brakes then have a mechanic check them. Do NOT drive with faulty brakes. Question - Tell me how you'd check the brake lights are working on this car. Answer Details - Explain you'd press on the brake pedal and either reverse the car up to a reflective surface so that you can check each bulb or have someone check for you. With both sisters passing thanks to Dave it was a no-brainer to learn with him. Lessons were always relaxed and Dave made things clear and simple to learn. I have already recommended Dave to friends and would have no hesitation to do so again. Question - Tell me how you make sure your head restraint is correctly adjusted so it provides the best protection in the event of a crash. Answer Details - The head restraint should be adjusted so the rigid part of the head restraint is at least as high as the eye or top of the ears, and as close to the back of the head as is comfortable. Note: Some restraints might not be adjustable. Question - Tell me where you'd find the information for the recommended tyre pressures for this car and how tyre pressures should be checked. Answer Details - Manufacturer's guide, use a reliable pressure gauge, check and adjust pressures when tyres are cold, don't forget spare tyre, remember to refit valve dust caps. Additionally - Check the tyres for obvious signs of low inflation. If low, inflate to the recommended pressure. Do NOT over inflate. 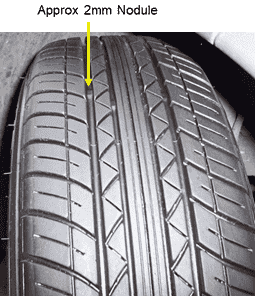 Question - Tell me how you'd check the tyres to ensure that they have sufficient tread depth and that their general condition is safe to use on the road. Answer Details - Use a depth gauge to check that the depth of the tread is 1.6mm or more across the central three quarters of the tread and all the way round. Check the tyre walls for cuts or bulges. Additionally - Manufacturers mould treadwear indicators into the grooves of the tread. If any part of your tyre is worn down to be level with an indicator then your tyre is approaching the 1.6mm legal limit. If any cuts penetrate through to the metal webbing inside the rubber of the tyre then the tyre requires replacing as it could 'blow' while driving. David is a brilliant instructor with a really good manner, a smashing guy and can't thank him enough, cheers David. Question - Tell me how you'd check that the headlights & tail lights are working. You don't need to exit the vehicle. Answer Details - (The ignition is required for your Glencor driving instructor's car). 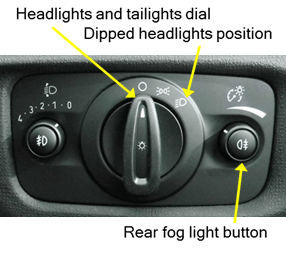 Explain you would turn the 'headlights and tail lights switch' to the dipped headlight position, then you would walk round the car to check the lights (as this is a 'tell me' question, you don't need to physically check the lights). When completed, remember to turn the 'headlights and tail lights' off (except in conditions where they will be needed while driving). Question - Tell me how you switch your headlight from dipped to main beam and explain how you'd know the main beam is on. Answer Details - Explain you'd switch on the ignition, then turn the headlights and tail lights on, then, pull the 'main beam (full beam) lever' until it clicks. The main beam blue warning light should now be illuminated on the instrument panel). When completed, remember to turn your main beam off by pulling the main beam lever again until it clicks; and remember to turn the 'headlights and tail lights' off (except in conditions where they will be needed while driving). Question - Tell me how you'd check the direction indicators are working. You don't need to exit the vehicle. Answer Details - Explain you'd switch on the ignition, then switch on the left indicators, and walk round the car checking the indicator bulbs. Then you'd switch over to the right indicators and check them for correct operation. Additionally - If the indicators flash at twice the normal speed then this usually indicates that one of the bulbs is faulty. Question - Tell me how you'd switch on the rear fog light(s) and explain when you would use it/them. You don't need to exit vehicle. Answer Details - (The ignition is required for your Glencor driving instructor's car). Explain you'd turn on the headlights and tail lights then press the 'rear fog light button' to turn on the rear fog light. The 'rear fog light warning light' should now be illuminated on the instrument panel). When completed, remember to turn the rear fog light off by pressing the rear fog light button again. The fog light(s) should be used when visibility is below 100 metres. Dave is an absolutely exceptional driving instructor. I was really nervous about learning to drive but Dave is so patient and supportive; he never made me feel bad about making mistakes and he never let me get despondent. He is also incredibly knowledgeable and professional, he will always take the time to talk you through your mistakes or sketch out a diagram to show you how to handle the situation better next time. He also gave me plenty of time to practice the manoeuvers to make sure I was confident before my test. I would ABSOLUTELY recommend choosing Dave as your driving instructor; he is a truly lovely person and a fantastic instructor. Question - Tell me how you'd know if there was a problem with your anti-lock braking system. Answer Details - A few seconds after switching on the ignition, the ABS warning light should turn off. If the ABS warning light remains illuminated then there is a fault with the anti lock braking system. Question - Tell me how you'd check the power-assisted steering is working before starting a journey. Answer Details - With the engine switched off, use your left hand to turn the steering wheel approximately two inches and then hold it there. When the engine is now switched on the steering wheel should give a slight movement against the left hand i.e. lighten. Alternatively, as you drive off, turn the steering wheel and check that it is not 'heavier' than usual. Question - Open the bonnet and tell me how you'd check that the engine has sufficient engine coolant. Answer Details - Explain you'd check that the coolant level is between the maximum/minimum markers on the coolant expansion tank. If low (and only when the engine is cool AND not switched on), remove the coolant cap and top up with coolant (or clean water). Additionally - Do Not remove the coolant cap while the engine is hot as there is a danger of being scalded by hot water escaping under pressure. If frequent topping up is required then there is a leak in the system. Have this checked and repaired. I would definitely recommend Dave to anyone looking for a calm, patient driving instructor and an enjoyable learning experience. I was really nervous about driving but Dave's constant positivity and reassurance made me feel relaxed and confident. I would definitely recommend. Question - Open the bonnet and tell me how you'd check that the engine has sufficient oil. Answer Details - Explain you'd pull the dipstick out, wipe it clean, then push it fully back in for a couple of seconds, then pull the dipstick back out and check that the oil level is showing between the maximum/minimum markers. Additionally - The oil should always be checked with the car on a horizontal surface, not on a slope. If the engine oil level is low, then remove the oil filler cap and top up with the appropriate oil and amount (to get the correct amount, pour in a small amount of oil at first then a couple of minutes later check the oil level again, repeat until you have the correct amount). Do Not over fill, and, make sure the filler cap is replaced securely. 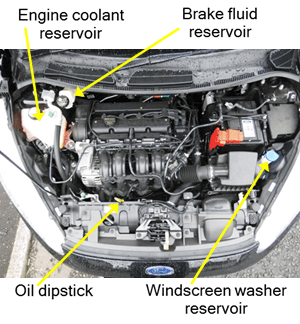 The engine oil should be checked when the engine is cool AND switched off, if the engine has been running then it should be checked several minutes after the engine has stopped thereby giving time for the oil to drain down and settle into the engine sump. Question - Open the bonnet and tell me how you'd check that you have a safe level of hydraulic brake fluid. Answer Details - Explain you'd check that the brake fluid level is between the maximum/minimum markers on the brake fluid reservoir. Additionally - If low, remove the reservoir cap and top up with the appropriate brake fluid (refer the manufacturer's handbook). If frequent topping up is required then there is a leak in the system. Have this checked and repaired. Note: Brake fluid is very corrosive so if you spill any on the car paintwork, wipe it off immediately with soapy water. On the day of your driving test you will be asked a 'show me' question while you are driving. David is a brilliant driving instructor! His teaching style of breaking down the lesson and taking short breaks to focus on weak points and working on correcting them is how I came to have confidence behind the wheel and the ability to pass my driving test! His pass plus is also a must to improve on motorway, His pass plus is also a must to improve on motorway, all weather and night driving. David is a great guy and won't mess you around! Highly recommended! If it's a pass you're for then go with Glencor! Question - When it's safe to do so, can you show me how you wash and clean the rear windscreen? 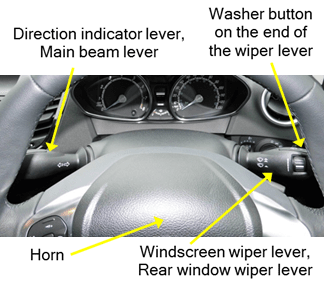 Answer Details - Pull the wiper lever towards your steering wheel to operate the rear screen washer. Question - When it's safe to do so, can you show me how you wash and clean the front windscreen? Answer Details - Press the button on the end of the wiper lever to operate the front windscreen washer. Question - When it's safe to do so, can you show me how you'd operate the horn? Answer Details - Press the horn button and listen for the horn sounding. Make sure that you don't alarm any other road users whilst testing the horn. Michelle Brown of Springside, Driving Lesson Testimonial I was gladly recommended to Dave by a friend, having previously taken lessons with another instructor and getting nowhere! Dave helped me to become relaxed and confident while learning as anything I asked or didn't know was fully explained in an easy detailed way. I had an enjoyable learning experience with Dave thanks to his professional and positive manner; I managed to pass first time. Thanks again, you have the patience of a saint. Question - When it's safe to do so, can you show me how you'd switch on your dipped headlights? Answer Details - From centre, turn the headlights and tail lights dial clockwise two clicks to the dipped headlight position. Glencor was recommended to me by my sister who also passed first time. Dave is a very polite, patient and calm person. Dave boosted my confidence a lot. Any questions I had were answered to a fantastic extent. I recommended Glencor to many of my friends and wouldn't hesitate to recommend Dave to anyone. Thanks very much Dave, everything was much appreciated. Glencor was recommended to me by a friend who was also learning with him. His knowledge of driving is very extensive; every question I had was answered and fully explained so I was never left with any doubt. Dave showed patience and professionalism in every lesson we had and never made me feel like I couldn't accomplish something. I passed first time with Glencor and I would highly recommend Glencor to anyone who is thinking of learning to drive! Question - When it's safe to do so, can you show me how you'd set the rear demister? Answer Details - Press the rear windscreen demister button. Question - When it's safe to do so, can you show me how you'd demist the front windscreen? 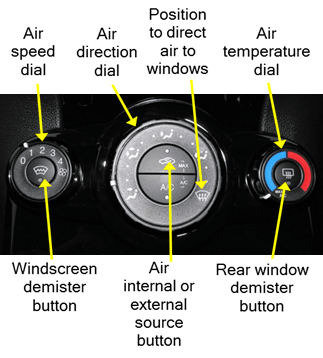 Answer Details - Either press the front windscreen demister button or turn the air direction dial to the windscreen position. Question - When it's safe to do so, can you show me how you'd open and close the side window? Answer Details - Press the window control down two clicks then let go. The window will continue to open fully. Pull the window control up two clicks then let go. The window will continue to the fully closed position. Note: The windows have a closure safety device and might not fully close due to an uneven road surface. If the window doesn't fully close then simply pull the window control again. I would recommend Glencor to anybody. As learning to drive was something I was secretly putting off it was such a relief to discover it could not only be an easy and relaxing experience, but also something I could actually look forward to! I passed in what felt like no time at all, and with more confidence than I ever imagined I would have. I truly can't imagine a better instructor - thanks. Instructions Given By The Examiner And What They Mean. Your Glencor Driving School instructor uses these instructions during driving lessons. The roundabout instructions listed herein are for two lanes on approach to the roundabout. List of driving instructions that require clarification. "Follow the road ahead unless road markings or road signs indicate otherwise." "If I want you to turn I will tell you in plenty of time." "Move off when you are ready." This instruction is given just before you drive off on your driving test. From the first line you should note that if you approach a crossroads and the examiner has not told you which way to go then you should prepare for and (when it is safe) take the road ahead. If you come to a junction and the road signs or road markings indicate that there is only one direction to turn then the examiner will expect you to be aware of this and will not tell you which way to turn. The second line is to assure you that the examiner will always endeavour to NOT give late instructions therefore giving you appropriate time to prepare. The third line states 'when you are ready' i.e. don't hurry. Simply make yourself comfortable and move off in good time. "Move off when you are ready and at the end of the road turn left"
"Move off when you are ready and at the end of the road turn right"
This is used when you have stopped close to the end of the road, usually after the 'Left Reverse Round A Junction'. Remember, if you have been told to turn left then do NOT signal left until just after you move off. "Pull up at the side of the road." "Find a convenient place to park at the side of the road." Note that for these instructions you are NOT asked to park at a specific place e.g. "just before the junction", etc. therefore you should choose a place where it would be safe and legal as if you were going to leave your car there. During my time with Glencor driving school my needs in learning to drive were fully met. I passed my test within 6 months and David was more than encouraging and driving manoeuvres were fully explained. I felt at ease and every time I had a lesson my confidence improved greatly. I would fully recommend Glencor Driving School. "Pull up at the side of the road just before that parked car." "Pull up at the side of the road just before the next junction on the left." Note that for these instructions you ARE asked to pull up at a specific place, this is usually because the examiner is going to ask you to do something e.g. a manoeuvre, therefore you should park at the specified location and not worry about whether it is a safe location to park and leave your car. "Pull up at the side of the road just before that parked car and leaving enough space to pull out." This instruction is usually given when the examiner is going to check your 'Angled Start'. "Take the second road on the left, this being the first." "Take the second road on the right, this being the first." These instructions are used to give you time to prepare for the junction when two junctions are not far apart. If the examiner waited until you were past the first junction and then said "Take the next road" you would not have sufficient time to prepare for the junction. These instructions are used where there is a fork in the road and there are no road markings at the fork. You should observe appropriately for the direction you will be taking and a signal is usually not necessary. "At the next roundabout, take the road ahead." On approach to the roundabout do not signal. After entering the roundabout, observe and signal left appropriately for exiting the roundabout. "At the next roundabout, take the second exit to the left." Just as for the road ahead at a roundabout do not signal on approach. If you signal on approach then other road users would interpret that as you taking the first exit on the roundabout. The instruction used 'left' therefore you should approach in the left hand lane. After entering the roundabout, observe and signal left appropriately for exiting the roundabout. "At the next roundabout, bear left first exit." Just as for the road ahead at a roundabout do not signal on approach. The instruction used 'left' therefore you should approach in the left hand lane. As soon as you enter the roundabout observe and signal left appropriately for exiting the roundabout. "At the next roundabout, bear right second exit." Just as for the road ahead at a roundabout do not signal on approach. The instruction used 'right' therefore you should approach in the right hand lane. After entering the roundabout, observe and signal left appropriately for exiting the roundabout. List of driving instructions that are self explanatory. "At the end of the road turn left." "At the end of the road turn right." "Take the next road on the left." "Take the next road on the right." "At the next traffic lights, turn left." "At the next traffic lights, turn right." "At the next roundabout, take the road to the left, first exit." "At the next roundabout, take the road to the right, second exit." For this instruction the examiner can also say "third exit", "forth exit", etc. Note: Some test areas will have instructions that are applicable to those areas only therefore not all instructions are listed herein. Your driving instructor should make you aware of any specific instructions for your test area. Be prepared and understand the examiner's instruction.